Astronomy Science ~ The black hole at our galaxy can produce strange particles called neutrinos, as expressed by NASA satellites. If these findings are verified, it will be tracked neutrinos first time in the darkest regions of space and time. Subatomic activity was first detected by NASA's three satellites, which observe light x-ray: Chandra X-ray Observatory, the Swift gamma-ray mission, and Nuclear Spectroscopic Telescope Array (NuSTAR), as said NASA in a press release. Neutrino, of the Italian language, which means "little boy", behave as the name implies, because they are very small even by the standards of the subatomic. They are not charged and are not affected by electromagnetic forces which affect charged particles such as electrons and protons. As a result, they can travel across the vast expanse of the universe without being absorbed by the material that crossed its path (in fact, billions of neutrinos pass through your body every second!) And with no electric charge, they are deflected by magnetic fields when traveling across the universe. Although the earth continues buffeted by neutrinos from the sun, but neutrinos originating from outside our solar system could be millions or even billions of times more energetic. Scientists have long puzzled origin of ultra-high-energy neutrinos have. Estimating the origin of high-energy neutrinos are one of the biggest problems in astrophysics today, "said Yang Bai from the University of Wisconsin at Madison, who co-authored the study published in Physical Review D." We now have the first evidence that the Milky Way's supermassive black hole might produce highly energetic neutrinos ". By tracing neutrinos back to the black hole, the scientists will make one step closer to understanding how cosmic rays are made. These rays wreak havoc on microelectronics and life outside the protection of the atmosphere and magnetic field. Understanding the origin of them also provide deeper insight into how the universe works. But because neutrinos pass through the material so easily, it is very difficult to make the tool to detect where they came from. The IceCube Neutrino Observatory, which is located under the South Pole, only managed to detect 36 high-energy neutrinos since it began operation in 2010. According to NASA, the IceCube ability to synergize with the data of three X-ray telescopes, scientists will be able to search for violent events in space, which occurs at the same time when high energy neutrinos bombard the Earth. 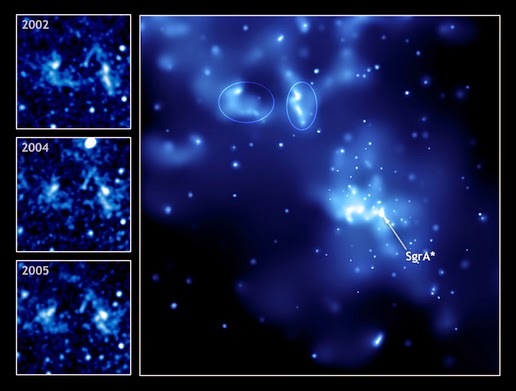 "We checked to see what happened after Chandra witnessed the biggest explosion ever detected from Sagittarius A (Milky Way's supermassive black hole)," said co-author Andrea Peterson, also from the University of Wisconsin. "And less than three hours later, IceCube detects the presence of neutrinos." Though Sagittarius A relatively inactive, every day a giant black hole continues to emit bursts of light momentarily. The scientists noted that after this black hole emits light, Swift and NuSTAR.mendeteksi presence of neutrinos. "It will be a very big problem if we know that Sagittarius A produce neutrinos," said co-author Amy Barger of the University of Wisconsin.